Randy says his motivation for giving to Spirit in the Desert is his desire to be a part of Spirit’s way of touching lives with healing and reconciliation. He also wants to support the retreat center’s vision of expanding the number of interdenominational, religious, and non-religious groups it serves. 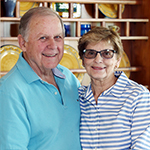 Bob served as Chairman of the Board for six years and Nancy participated in meetings and retreats for members of their congregation. Nancy’s retired parents from Wisconsin also served as retreat center live-in hosts for several years during the busy winter months. 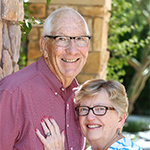 The Tiede’s support Spirit in the Desert because people of all faiths and backgrounds experience hospitality in a retreat setting and find renewal, reconciliation, healing, and transformation. It took a great deal of effort to organize the retreat center, develop programs, and find donors for more buildings. 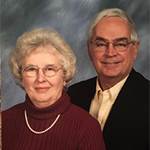 Mary and Howard were involved every step of the way turning the gift into the reality of a retreat center. 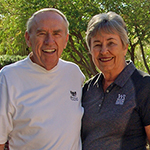 Make their own investments at the upper levels of Wings in the Desert with an annual gift of at least $5,000. Invite others to join them as Stakeholder Council Members. Consider joining The Simeon & Anna Society through their legacy gifts. Gather at least once each year in advance of the Annual Meeting of the Board of Directors to be briefed and offer their counsel on the strength and effectiveness of the ministry of Spirit in the Desert. When you come to Spirit in the Desert, you sense this has been an indigenous “holy place” for centuries, long before land titles of “ownership.” Even now, this place is held in trust by a local, national, and inter-national network of participants, presenters, donors, board, and staff; Lutheran, ecumenical, inter-faith, and seeking. All are stakeholders in the shared mission of renewing people’s callings in the world. The members of the Stakeholder Council advise the Board and advance the mission with annual investments of $5,000 and more. Once again, all are welcome! Spirit in the Desert was founded through the legacy gifts of a family with a vision for the blessing this retreat center would be for generations after them. Simeon and Anna saw God’s light to the nations beyond their years. (“My eyes have seen!” Luke 2:30). Members of The Simeon and Anna Society have made planned gifts in and/or documented their estate commitments to sustain the mission of Spirit in the Desert for generations to come. The Board of Directors will honor these legacy gifts for the long-term benefit of Spirit in the Desert. The names of living and deceased members of The Simeon and Anna Society will be inscribed in the Estrem Center and published in each Annual Report of Spirit in the Desert.